Be the first to share your favorite memory, photo or story of Sandy. This memorial page is dedicated for family, friends and future generations to celebrate the life of their loved one. 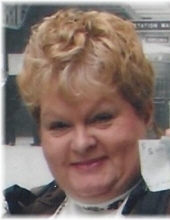 Sandy Jean Bogner, 71, of Henry, passed away Sunday March 31, 2019, 1:50 am at St. Joseph Home, Lacon. Visitation will be Wednesday April 3, 2019 from 5:00 to 7:00 pm at Calvert & Johnson Memorial Home, 513 Carroll St. Henry. Rosary will be recited at 4:30 pm. Mass of Christian Burial will be Thursday 11:00 am at St. Mary’s Church, Henry. Fr. John Bosco Mujuni will officiate. Burial will follow at Calvary Cemetery, Henry. Memorials may be made to St. Joseph Home Activity Account or to S.A.M.S. Rescue, Hanna City, IL. Sandy was born July 2, 1947 in Springfield, IL to Jane (Newell) Page. She married Mike Bogner on August 17, 1974 in Chillicothe, IL. He survives in Henry. Also surviving are her daughter, Hollie (Scott) Altpeter, of Elmwood and one grandson, Andrew Altpeter. Her mother, one brother, Ken page and one sister, Linda Page, preceded her in death. Sandy was a member of St. John XXIII parish, St. Mary’s Church, Henry, its Altar and Rosary Society and the Daughters of Isabella. She was also a member of the American Legion Auxiliary. Sandy was a homemaker, a waitress for 16 years and later was the Activity Director at St, Joseph Home, for over 16 years. She was retired form St. Joseph. Rosary recited at 4:30 PM. Wednesday. "Email Address" would like to share the life celebration of Sandy Jean Bogner. Click on the "link" to go to share a favorite memory or leave a condolence message for the family.